The emotion of falling in love immediately… where time stands still and hearts are set on fire. The thrill of love at first sight. A gourmand kiss, intense and delicious. The notes for the fruity floral fragrance include mandarin, apricot, bergamot, apple, jasmine, cinnamon, caramel, sandalwood accord and vanilla. 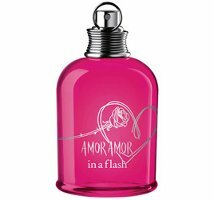 Cacharel Amor Amor In A Flash is available in 30, 50 and 100 ml Eau de Toilette. I wonder which fragrance has launched the most flankers. Amor Amor has got to be up there in the top 5. Sheesh! It may lose just because it didn’t launch til 2003, other contenders were earlier so have had more time: YSL Paris, CK One, L’Eau d’Issey. Probably others I’m not thinking of right away. I was able to smell this fragrance yesterday and I believe that it is one of the most mouth-watering fragrance I have ever smelled ! very nice floral blooming wrapped in fruity crumble notes that are not too sweet. the fresh and sparkling top notes counterbalance the gourmand caracter of this fragrance.